Press Forward SLADES: FUN IN CALIFORNIA!!!!! Last weekend we took a little trip to California. We have wanted to take our little ones to DisneyLand for quite sometime. Our older kids have been a few times, so last minute we packed up and took a little trip. We bought the kids hats, notice the biggest kid purchased one. 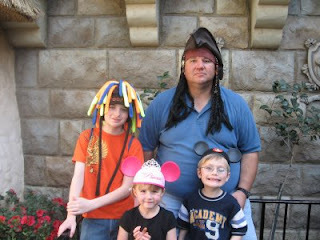 Tim wore his pirate hat around DisneyLand all day. It was hilarious and very entertaining. We would be waiting in line and people would slap him high five and make comments:) Inspite of all the people and waiting in line for rides we had a really great time!!! What a fun family trip! I just love disneyland. Its the happiest place on earth!! How fun!! I'm so glad you guys got to go. I love Disneyland! ha ha ha....seriously...that picture of Tim (coach) is hilarious. I love it.